It is no surprise that food is good for the body, especially growing ones! Whatever your kids eat houses important nutrients that can be used to strengthen their bodies to fight disease. However, certain foods are better than others, and do more for certain parts of their bodies. For example, certain foods are more beneficial to the health of the eyes than others. The following blog is a list of seven different foods that are great for the well being and function of young eyes. Fish is extremely good for young eyes. Specifically the oils in fish are extremely beneficial for the overall health of eyes. In fact, nutritionists often prescribe fish oil capsules to help with digestion, healthy hair and nail growth, as well as the health of eyes. Most fish contain omega-3 vitamins. When consumed those omega-3 vitamins are used to help aid and strengthen the retina in the back of the eye. The retina is responsible for housing rods and cones which are used to interpret color. The retina is also responsible for converting light we receive into the eyes, into neural signals to stimulate the brain. Most development issues of the eyes are related to problems with the retina. That is why, it is important to feed the body to help improve the retina’s strength and quality. If your little one has trouble eating fish, fish oil tablets might be another option to give them the best shot at healthy eyesight. Fish oil tablets can be broken and mashed into food or swallowed. Depending on the age of your child, you might have to covertly sneak the fish oil into their food. Eggs are not only an excellent source of protein, they are filled with vitamin A and minerals such as zinc. Vitamin A plays a role in the overall health of the cornea, while zinc contributes to the strength of the retina. Eggs are also most likely the easiest thing to get a youngster eat. After all, what kid doesn’t like scrambled eggs for breakfast? By making eggs for your kids, you can ensure they grow with a healthy body and pair of eyes! You have probably heard a thousand times how beneficial carrots are for your eyes. But why? What is in carrots that make them so good for your eyes? Well, much like eggs, carrots are filled with vitamin A. Vitamin A is very good for the eyes, as the vitamin directly affects and strengthens the cornea (the front or outside part of the eyes). Carrots are also chalked-full of beta-carotene. Beta-carotene aids the eye in helping fight infections and strengthens the cornea from getting infections from dirt and dust in the air. Turns out, oranges are really good for eye care. Oranges are filled with vitamin C which is a key ingredient for healthy eyes. When you eat oranges the vitamin C helps the development of the eyes and contributes to preventing the onset of cataracts. Aside from that, vitamin C also contributes to creating healthier blood vessels in the eyes. If your child is not a huge fan of oranges, we suggest having them drink orange juice or real orange juice smoothies. No matter how they consume oranges, the vitamin C affects their eyes the same. Though milk is extremely good for the development of strong bones, it is also good for developing healthy eyes. Much like eggs, most dairy products are filled with vitamin A and the mineral zinc. Both ingredients work wonders for eye development and help strengthen the retina. This item might be a little harder to get your kids to eat, as it is green and doesn’t taste like candy. Kale is extremely good for developing eyes because it contains, “antioxidants lutein and zeaxanthin, also found in eggs and other foods.” These two antioxidants are crucial to keeping healthy eyes and defending against cataracts. However, because kale is green and not always as exciting to eat, we suggest cooking the kale into chips. Simply sprinkle droplets of olive oil and bake for 20 minutes and you have created delicious chips that are healthy for your little ones eyes! Sweet potatoes are one of the best vegetables because they don’t taste like vegetables. Because of their sweet taste is might be easier to get your kids to eat them than any other vegetable. Sweet potatoes, much like carrots, are filled with beta-carotene. Beta-carotene is a precursor of vitamin A and is crucial to help with night vision and our eyes ability to adjust to different amount of light. Sweet potatoes also contain vitamin C, which also essential for strengthening the retina. Enjoyed our list? 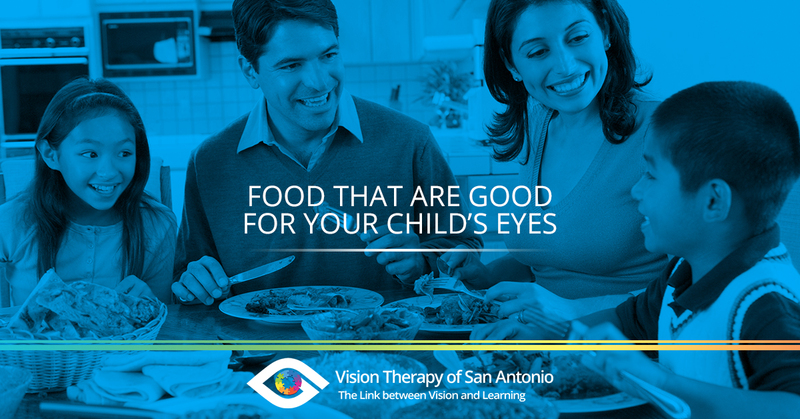 Stay tuned for yet another list of good foods to feed your kids for developing eye health! Also, if your child complains about their vision or eye health, make sure you visit Vision Therapy of San Antonio. Their talented staff and experienced optometrist can help you and your child with all vision questions and instruct you on certain vision therapy exercises. Contact us today!